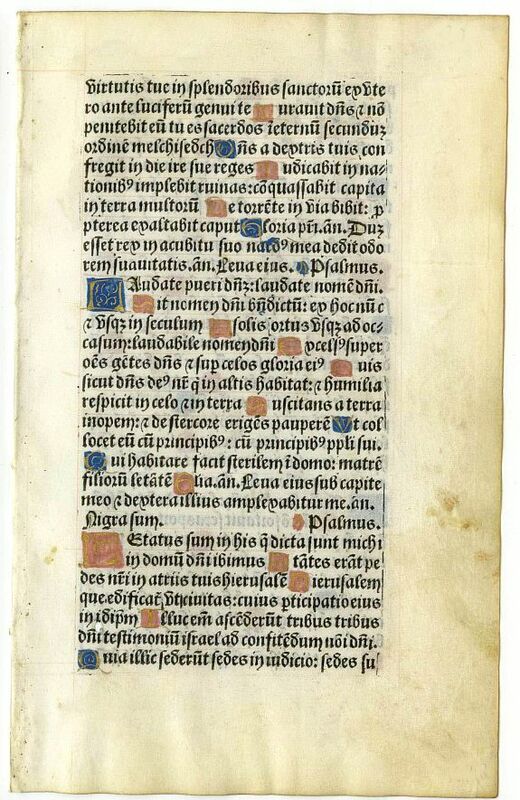 Description :"A wonderful leaf from a Book of Hours printed on vellum by Gilles Hardouyn for Germain Hardouyn ?librayre demourant entre les deux portes du Palays en l?enseigne saincte marguerite? ; ?bookseller living between the two gates of the Palace at the sign of saint marguerite?, Paris around 1518. The initials are done by hand in bright colours. Laudate pueri Dominum laudate nomen Domini Sit nomen Domini benedictum ex hoc nunc et usque in saeculum A solis ortu usque ad occasum laudabile nomen Domini Excelsus super omnes gentes Dominus super caelos gloria eius. Praise the Lord, ye children: praise ye the name of the Lord. Blessed be the name of the Lord, from henceforth now and for ever. From the rising of the sun unto the going down of the same, the name of the Lord is worthy of praise. The Lord is high above all nations; and his glory above the heavens."